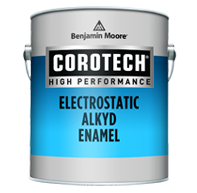 Electrostatic Alkyd Enamel is a quick-dry, rust-preventive paint that is applied only via electrostatic spray, with no need to adjust polarity. This high-performance formula is engineered for use on ferrous and non-ferrous metal in OEM and industrial refurbishing. It is also well suited for application to metal surfaces, such as furniture, lockers, machinery, tools, doors, and pipes. Silicone Alkyd High Heat is designed to protect steel that is exposed to heat ranges up to 800 °F (425 °C). This product exhibits excellent weathering, resists mild industrial chemicals and moisture and is specific to industrial use.